We look forward to your next visit to our Christmas Tree Farm! Our Christmas Tree Farm is located in the rolling hills of northern Harford County, Maryland, close to the Pennsylvania line. We're conveniently located in Jarrettsville, close to Bel Air and Forest Hill, and just an hour from Baltimore..
From Towson - North on Dulaney Valley Rd. Bear left after Loch Raven Bridge and continue on Jarrettsville Pike (Rt. 146) through Jacksonville to blinking light at Madonna. (Rt. 23). Turn right, go 2 miles to Jarrettsville. Turn left at light (Rt. 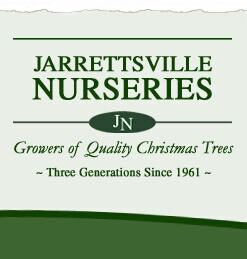 165) and drive 5 miles to Jarrettsville Nurseries at Holy Cross Road. Turn right onto St. Clair Bridge Road and then left onto Holy Cross Road to Jarrettsville Nurseries at Holy Cross Road. From Baltimore & Points South - I-95 N to exit 74 (Joppa Fallston). Turn left at end of ramp onto Rt. 152N and follow to Rt. 165N. Turn right and continue through Jarrettsville. Go 5 miles to St. Clair Bridge Road. 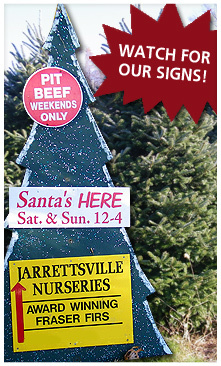 Turn right and then left onto Holy Cross Road to Jarrettsville Nurseries at Holy Cross Road. From Bel Air - Take Rt. 24 N. to Forest Hill and continue through Rocks State Park. Turn left onto St. Clair Bridge Rd and then right onto Holy Cross Rd to Jarrettsville Nurseries at Holy Cross Rd.